The Shabby Stamper: Knobbly Gnome Walk -- day three! Isn't this the cutest little shy Gnome? 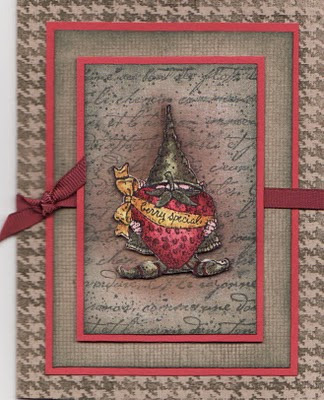 I love the layers on this card -- I've always been a firm believer in using as many background stamps as possible! If you haven't tried stamping out your backgrounds in Craft inks, you ought to try it. The colors really pop and the saturation is fabulous. The card base and the first layer are pretty easy to figure out: single background stamps. The center layer is more involved -- French Script was stamped in Always Artichoke craft ink and Cheesecloth was overstamped in White craft. The spatter pattern from Itty Bitty Backgrounds was stamped in both White craft and Always Artichoke and Close to Cocoa classic inks. The shadow behind the shy Gnome was done with a sponge in Close to Cocoa. I love all the textures on this card. I haven't had time to play with my gnomes as I am working on a big project, but I CASED this layout come take a look! Beautiful use of the background stamps Lisa. As you know, I love my background stamps! !